Chronic sinusitis is one of the most common medical diseases in the United States, affecting nearly 30 million Americans. 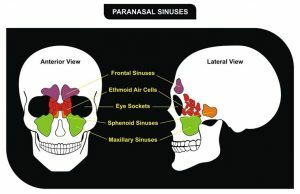 Chronic sinusitis is defined as inflammation of the paranasal sinuses .We are beginning to understand that there is a genetic basis behind chronic sinusitis that may make some individuals more prone to develop the disease, but the development of chronic sinusitis also usually requires an environmental trigger such as allergies or a sinus infection. Inflammation of the sinuses results in obstruction of the narrow natural drainage pathways of the sinuses, which in turn leads to further infection and inflammation of the affected sinus and leads to a vicious cycle. 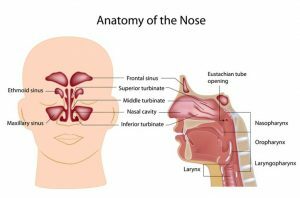 Symptoms of chronic sinusitis include nasal obstruction, facial pressure, runny nose, postnasal drip, and decreased sense of smell. Chronic sinusitis is a chronic condition, often causing symptoms for years or a lifetime. There is no magic cure for chronic sinusitis, but medical, and sometimes surgical, treatments have a great chance of improving patients’ quality of life. Many patients are successfully treated with medical therapy including antibiotics, oral and nasal steroids, oral and nasal antihistamines, and saline rinses. 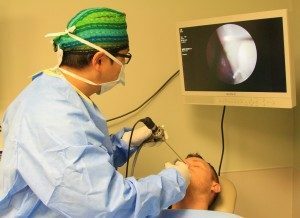 However, those patients that have persistent symptoms despite medical therapy may require endoscopic sinus surgery to control their disease.